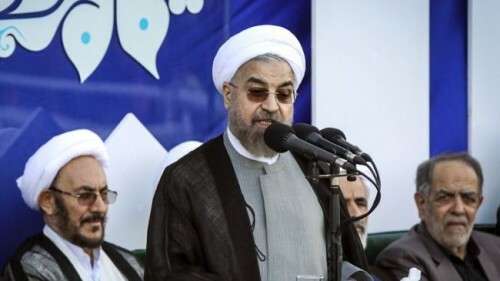 As Iran tries to claim credit for the counter-offensive against Islamic State jihadists in Iraq, President Rouhani has declared, “If it wasn’t for the assistance of the Iranian nation and the Iranian government, today we would not be witnessing relative security” in the country. The rhetoric continues a marked shift for Tehran, which had denied widespread reports that troops and military advisors — including Qassem Soleimani, the commander of the elite Qods Forces of the Revolutionary Guards — had entered Iraq soon after the capture of major Iraqi cities by the Islamic State in June. However, two weeks ago Iran admitted the involvement, with Interior Minister Rahmani Fazli saying that officials of the Iraqi Kurdistan Regional Government requested the assistance, which included “consultations and organizing Kurdish forces”. And last week Iran — facing increased American intervention, including airstrikes, in support of the Kurdish-Iraqi counter-offensive — said its military advisors had been instrumental in the breaking of the siege of Amerli in northern Iraq. Photographs were circulated of Qods Force head Soleimani alongside senior Iraqi political and military officials in the town. Owing to their double-standards, the Americans have not been so serious in fighting the ISIL (Islamic State) by today; they supported the ISIL in Syria in different forms for a long time and now cannot decide what to do with the slogans they have chanted for such a long time. Zarif said that, in contrast to the US, Iranian official “have realized the Islamic State’s danger since the very first day”. Iran has hit back at the International Atomic Energy Agency, which criticized Tehran on Friday for not complying with agreements over information and inspections of nuclear facilities. The IAEA said on Friday that Iran had complied with only three of five steps agreed last November, failing to provide details on explosives which could be part of a militarized program. The Agency said Tehran had completed one step by an August 25 deadline, and two others in the following weeks. The spokesman of Iran’s Atomic Energy Organization, Behrouz Kamalvandi, responded on Saturday that Tehran had agreed only to the first step by August 25, “although we had also stated repeatedly that we would strive to take the measures sooner than the deadline if possible”. Kavalkandi also criticized the IAEA for delaying information that Iran had complied with the request for material on its explosive bridge-wire detonators, which the US and allies said could be used in production of an atomic weapon. He said the issue had now been resolved and could be taken off the table. Iran and the IAEA had agreed in November and February on a series of measures for inspections and information on Tehran’s nuclear program. However, tension has escalated over the last month, with Tehran accusing the Agency of working for the US and other Western powers. Iran has denied a report that it might be willing to reduce its number of centrifuges enriching uranium to 5%, in an attempt to reach a comprehensive nuclear deal with the 5+1 Powers. An “Iran source” told Barbara Slavin of Al-Monitor that Tehran “might be willing to scale down from 10,000 centrifuges to 7,000”. Iranian officials, including the Supreme Leader, have said that Tehran wants to increase its stock of 19,000 centrifuges — about half of which are operational — and/or introduce new models which can significantly raise output. They have set a goal of 190,000 Separative Work Units, about 20 times the current capacity. The US and its allies have demanded that the stock be reduced for any agreement in nuclear talks, due to resume on September 18 in New York. Notably, Slavin’s “Iran source” did not say if the 7,000 centrifuges would be the current IR-1 model, or the IR-2m, which has been introduced into the Natanz plant but is not yet operational — or even IR-4 or IR-8 models, which Iran claims it can develop.